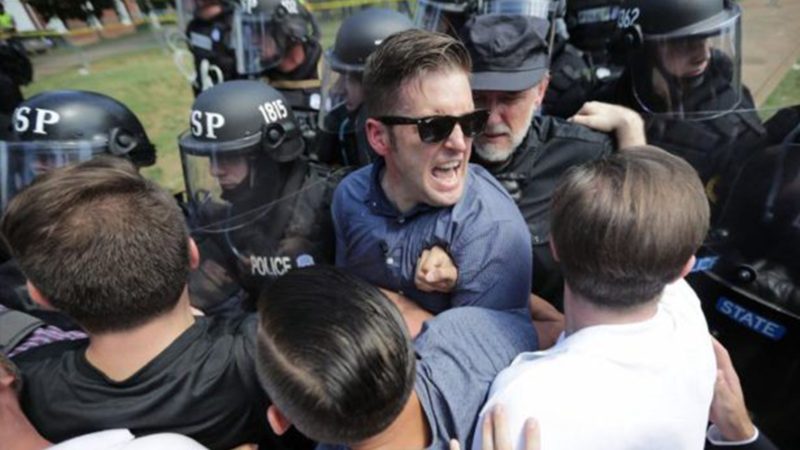 At the University of Florida, a protester urged Richard Spencer to take responsibility for the violence he inspired at Charlottesville. Later that night, three of his supporters were arrested for attempted murder. Shortly after Richard Spencer finished his poorly received appearance in Gainesville on October 19, his supporters Tyler Tenbrink, Colton Fears and William Fears allegedly started another confrontation, which would quickly turn violent. Around 5:30 p.m. the Fears brothers and Tenbrink pulled up in a silver Jeep at the corner of 34th Street and Archer Road, just blocks away from the venue Spencer spoke at, and struck up an argument with a group of protesters. Witnesses said the trio became belligerent, throwing out Nazi salutes and praising Adolf Hitler. Then the Fears brothers, allegedly urged Tenbrink to shoot the protesters. According to law enforcement, Tenbrink pulled his gun, fired one shot, missed the group and the trio sped off. Later that night, law enforcement arrested the three for attempted homicide, setting a $3 million bond for Tenbrink and a $1 million bond for each of the Fears brothers. Tenbrink is a convicted felon, so he faces an additional charge for illegally possessing a firearm. Prior to the event the three spent considerable time talking to the media outside the Curtis M. Phillips Center. Tenbrink repeatedly told reporters that “oppression” of any kind is just a myth people use to get sympathy. He also said, "If Hitler would've changed his narrative a little bit, he'd have taken over the whole freakin' world."